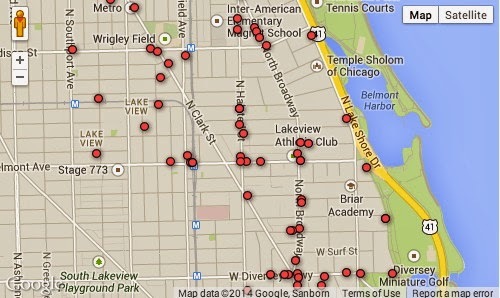 Chicago Spectrum has mapped all of the thefts reported in our neighborhood during January. You can zoom in to street level and get more details by clicking on any dot. Theft, by the way, is taking something that does not belong to you without threatening or harming another person. Examples of theft include taking a bike off of the street, pick-pocketing, stealing a phone from a restaurant table, shoplifting, etc. Thefts do not include the more serious crimes of burglary and robbery.